If you have purchased a branded Notebook or PC, you must have seen a logo, Manufacturer and Model name in Windows System properties. This are the OEM information that every manufacturar attaches in a PC/Laptop they build. If you are a tech savvy user and don’t like such information to be displayed in your computer or if you are a computer assembler and build custom PC, you must have liked to change, remove or add custom OEM information. OEM information can be added, removed or changed by doing some alterations in Windows Registry. If you don’t like to play around Windows registry, you may use a portable software called OEM Injector from the same developer as Encryption Apparatus. You can write anything in place of those pink colored texts. This will show up later in the OEM and Support Information. Save the Notepad as OEMINFO.INI. Now place OEMLOGO.BMP and OEMINFO.INI in the following location. And your system properties will now show the OEM and Support Information. Right Click on Logo, select Modify and change the Value data to the location of the logo image. Right Click on Manufacturer, select Modify and change the Value data to the custom Manufacturer name. 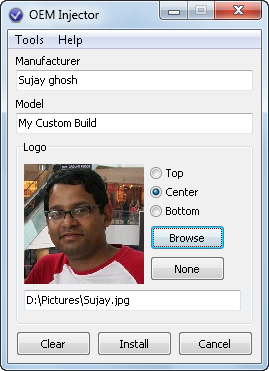 Right Click on Model, select Modify and change the Value data to the custom Model name. Close regedit and go to system properties to see the change. Download the current version of OEM Injector from the following link. The downloaded archive is 654 Kb in size and has the following file hash. Extract the archive using 7Zip or other software that supports.rar files. Execute the unsigned standalone executable [OEM Injector.exe ; 1.72 Kb] to open the software. No installation is required. The software can run on Windows XP to Windows 7. So if your are using an earlier version of Windows use the manual trick. The software GUI is clean and exactly the settings that is required. It is not resizable and multiple instances is allowed. The software is multilingual, supports English and Russian language. To clear the current OEM Information, click on Clear. To add custom OEM Information, type the Manufacturer and Model name and browse for image to be used as logo. It supports .bmp, .jpg, .png and .gif image formats. If selected image is a rectangle, you may choose the part of it to crop into a square by clicking one of the radio buttons on the right. If its is square, you will not have to do anything. To set the entered information as the OEM Information, click on Install. You will find the changes by going to System Properties. The manual can be found in the About section of the software, in the product webpage and in the readme file that comes along with the standalone executable. The software uses minute system resources. If you like manual control on your PC, go through the steps mentioned above to change the OEM Information, else use the software OEM Injector. If you using a PC with earlier version of Windows that XP, you have to use the manual tricks anyway. About the software, it is well written and is efficient. I just want it to be distributed as a Zip archive, since by default Windows can open that kind of archive only. This entry was posted in Free, OS Enhancement, Portable, Software, Tips, Windows.